Enjoy a free half hour consultation1 with one of our pond experts when you book your first site visit with Head Squared Aquatics. Head Squared has experience with many problems which can arise relating to water features/ponds. (Please see common problems section of our website for more information). Struggling in vain with your filter setup, poor water clarity or high maintenance is a thing of the past. Whether by telephone, email or a site visit, our professional consultation service could not be more simple. 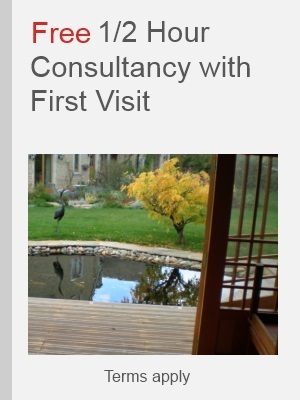 After our free consultation, we can supply an estimate (at no cost) for any works we would recommend for your pond. You can then make an informed decision on whether you would like to go ahead with any works making use of our thoroughly researched and industry leading, written estimates. Please contact us to check our rates and to claim your free half hour consultation today! Only one free half hour per customer. Site visits may be subject to a call-out charge and/or travel costs where outside standard branch catchment areas. After the expiry of the free half hour consultation, the usual hourly rate is applicable for any further consultation work requested by customer. Prices will be subject to VAT where the consultant is VAT registered. All services and products supplied by or on behalf of Head Squared Aquatics are subject to our standard Terms. Not redeemable for cash. This offer may be revoked or amended at any time without notice.